Thanks to my connection at The Mom Reviews, I recently attended the press event for the arrival of the Cavalia horses for their show in San Jose, CA. I'm a little behind in posting about it, but due to popular demand the show has been extended to run through August 19th at the San Jose location, giving people a LOT more time to see this extraordinary show. If you're not familiar with Cavalia, here's what their website has to say about the experience of seeing it. 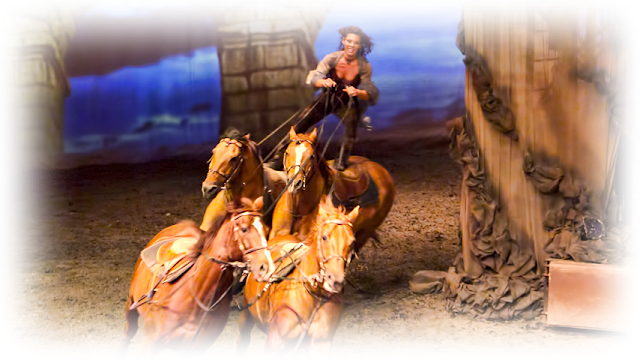 "Cavalia is a fresh mix of equestrian and performing arts, multimedia and special effects. Conceived by Normand Latourelle and often labelled an equestrian ballet, Cavalia is a spectacular and moving tribute to the relationship between men and horses throughout history, a dream of freedom, cooperation and harmony. In a fairy tale setting filled with poetry and emotion, the show innovatively integrates acrobatics, dance, aerial stunts, live music and equestrian arts. Under the White Big Top, a 50-metre stage permits the horses to express themselves in all their splendour, nobility and strength, often completely free." When the big top went up in San Jose, just blocks from my previous job, I was very curious as to what it was. When I attended the press event, I got a nice up close and personal look. We were all eager to see the horses arrive, which they did, much to the excitement of all the riders and trainers who were gathered near the stable to greet them. Each rider practically ran to meet their horse as it was unloaded from the truck, and you could see genuine joy in both human and horse as they said their hellos. It had been several weeks since they'd all been together, as the horses are turned out in a field for 2 weeks between each show location, giving them full freedom to just be horses. They return happy and sassy, ready to work again with the people they love. Once everyone was unloaded and settled in their stalls, we were allowed to go in to see everyone up close. What BEAUTIFUL horses they are! All were even tempered and patient as we milled through and photographed them. I could have stayed there all day and night. We weren't allowed to touch the horses in case we might have a germ they really don't need to pick up while on the road, but this guy (below) and I had a moment right before I left. He's a Percheron, and they are BIG. He was near the exit at the end of my visit, and we touched noses to say hello. I love a moment like that. Here he is with his back to me the first time I walked by. Once we were done in the stables, they took us into a practice ring, where some of the horses and riders gave us a demonstration of what they do in the show. I'm sure it's nothing compared to what it must be like under the lights, but we were delighted nonetheless! The lady in these pictures is Fairland Ferguson, who is from South Carolina and has been with the show for three years. When the horses were being unloaded earlier, she was wonderful about sharing details with us about each one and how things work behind the scenes. Fairland is demonstrating Roman riding, something she does in the show that is apparently very exciting! Here's an official show picture that proves it. Another impressive moment in the show is when this gentleman and his horse do a routine that does not include harnesses or leads or food of any kind. He and his horse simply play and run together a bit, showing the relationship that they have. It was very moving. The final demonstration was with a group of horses doing a Carosel routine, where they must follow each other in a circle or figure eight, keeping the same time and positioning. It's impressive to see, but even more amazing is how gorgeous these horses are. There was even an Arabian, which you can see in the middle here. Here is a video I clipped together, showing a bit of each demo. Enjoy! A big thank you to Cavalia for the opportunity to preview the horses and their gifts before they opened at our San Jose location. I was in no way compensated for this event and all opinions are my own. If you are interested in seeing when they'll be visiting near you, go to their web page at www.cavalia.net and look at where they're heading next. You don't want to miss it!